Aging is a complex process that involves interaction of several genetic and environmental factors. A part of it is dictated by our genes over which we have little control (yet), but a big part of aging process is the result of what our body faces in day to day life over years – diet and lifestyle choices, stress, and sun exposure. No matter what the causes are, the aging involves certain changes in our skin hallmarked by damage and loss of connective tissue of the skin. Collagen and elastin – molecular strands that provide tensile and elastic support for skin – are lost or deranged, and hyaluronic acid – a water-retaining gel that provides volume and plumpness to the skin – is diminished. Other important components such as healthy blood vessels and cells such as fibroblasts (which are eventually responsible for making new collagen, elastin and hyaluronic acid) are also lost or become gradually inefficient as we age. 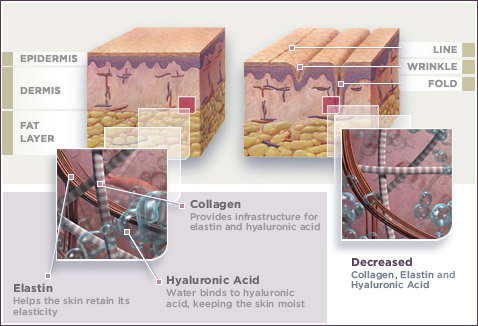 We can use an example to better illustrate the contribution of collagen and hyaluronic acid to healthy, rejuvenated skin. Think of tires of your car. Collagen and other components of extracellular matrix are similar to the wall of the tire, and hyaluronic acid acts like the air inside the tire. For the tire to function properly, the wall (collagen) should be intact and it should also be properly inflated (hyaluronic acid). Failure or loss of either one is enough to cause a deflated tire in our example, or an aged face, with wrinkles, deep lines, prominent bony features, dropped cheeks and more. Aging does not happen overnight, and there are many things we can do to slow or reverse the process. Dermal fillers are among the most effective treatments that when used skillfully by your doctor, can restore and replenish collagen and hyaluronic acid. The results can often be seen instantaneously and right after injection for some fillers, while some other fillers work their magic more gradually. Hyaluronic acid-based fillers: The same hyaluronic acid gel that is naturally present in our skin and gives it its volume has been provided by pharmaceutical companies in form of various FDA-approved dermal fillers such as Juvederm, Restylane, Perlane, Juvederm Voluma and Belotero Balance. All these fillers are based on hyaluronic acid, but the hyaluronic acid in each filler has been formulated and/or reconstituted specifically to have certain characteristics. For example, Juvederm Ultra Plus is thicker than Juvederm Ultra, making it more suitable to treat deeper lines. The hyaluronic acid molecules in Juvederm Voluma have been modified to make them more resilient and resistant to natural enzymes occurring in the body that work to degrade it. Hence, Juvederm Voluma can be used to achieve long-lasting results, restoring lost volume lasting for years. As another example, Belotero Balance is relatively thinner and more suitable to use when a general and uniform volume restoration is desired for areas such as neck or face. Collagen inducing fillers: These fillers act by stimulating body to create and remodel natural collagen. The fillers in this group include Radiesse, and Sculptra, both long-acting fillers with results persisting over a year and more. At Amoderm, we offer various types of fillers including the ones mentioned here. All our filler injections are performed by licensed experienced physician using FDA-approved medication, and whenever possible, we perform injections using micro cannula for less bruising and discomfort. Call us today at 949-266-7346 to schedule your complimentary consultation!